I love watching hot air balloons being prepared too. These pictures provide the perfect feeling of magic as they are stretched out and filled with air. 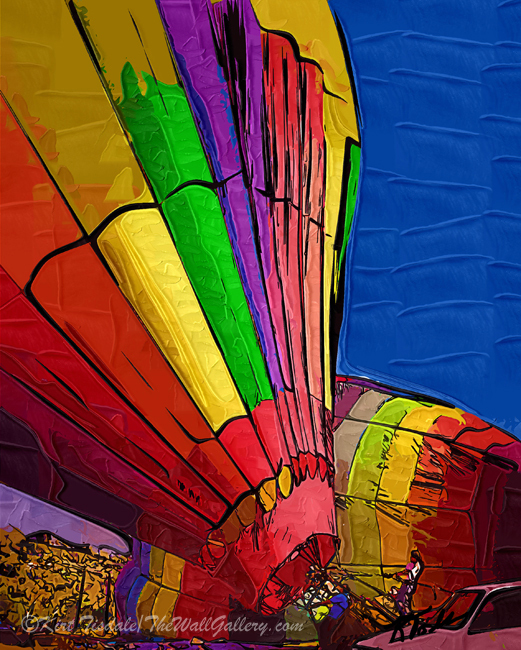 Thanks Darlene…I always feel like the inflation process is so beautiful and to watch the envelope of the balloon go from just colorful cloth to this large balloon…awe inspiring!! Thanks for stopping by!! 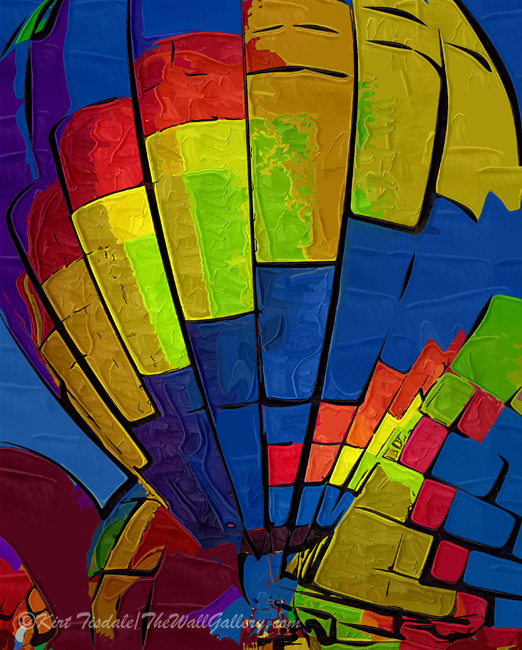 Your images definitely convey a sense of fun and color! I bet seeing the hot air balloons in person is a great fun. Loved it….once we were onboard and “sailing” I put my camera down and just took it all in…such a peaceful experience!! Thank you very much Dan…I always seem to approach things just a little different…thanks for the compliment!! Kind of a fun brightly colored portrayal…thanks for the compliment…appreciate you stopping by…hope all is well with you!! Like??? How about LOVE! Your art is brilliant! Side note: these are from the San Diego sunset coast to inland rides….only did it once in all the years we lived there….loved it!! Yay! I love balloons, Kirt — they’re such happy images. I really like the effects and colors on these. The “Stand it Up” image has terrific detail too. I think that’s my favorite. Love that quote…..so profound…thanks for the feedback on the balloons and for sharing that quote!! Have a great rest of your weekend and a great week! I’ve always loved watching them being filled but they can catch a person off guard with the noise they make! I agree….it’s especially beautiful to watch them fill when there is a large group. It is a bit noisy, but visually stunning! you captured the moment perfectly Kirk! Thank you very much…I love the bright vibrant colors!! Thanks for stopping by!! Ping back headed your way, from this post. Bright, colorful and fun is right!!! Great set! As you might imagine Kirt I adore these bright beautiful images. I can almost here the air oozing out of the balloon that is on its side. Love the technique. I’m smiling that much more today for having seen these beauties. Thank you Jennifer for the reblog and compliment!! I love these prints, Kirt!! I really do! Sending good thoughts for the rest of your week! 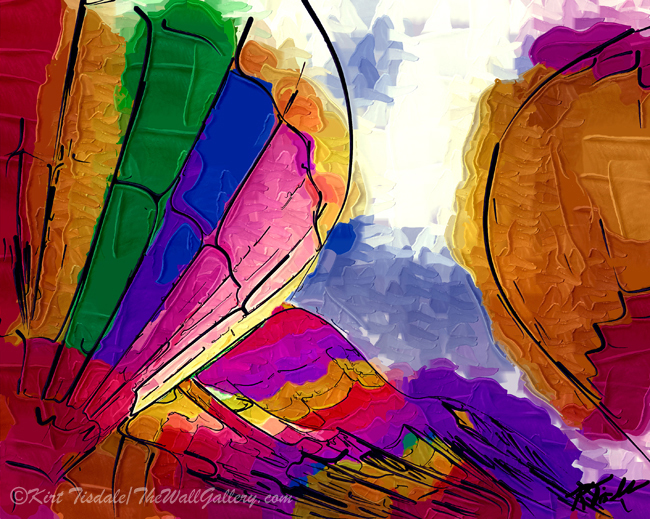 Thanks for stopping by Lorrie….had fun creating them and have a love for hot air balloons….glad you enjoyed them!! Have a great rest of your week! !